“Thankful… Confused…. Happy…. Unfulfilled…. Proud…. Inspired…. Frustrated…. Melancholic…. Optimistic…. But, most of all…. Determined. That’s been the gamut of my emotions for the last 24 hours, and logging on to our Facebook group today to see the commentary of everyone else, I’m glad to see I’m in very good company. We’ve never been one dimensional, and we’re sure not going to start today. We really wouldn’t want it any other way, would we? After all, if it weren’t for Senator Corman’s initiative to keep the $60 million in state, we would have nothing at all to celebrate today. For him and Rob McCord (and Judge Covey), I am thankful. They truly over-delivered during their leg of this relay, and we can only hope others will have as much success as the baton continues to be passed. I’m happy for the Paterno Family, the coaches and players whose records deserve the respect and honor they rightly earned. Yet, I’m as confused as everyone else about how a “complete repeal” leaves so many undeserved punishments in place (and how Mark Emmert can get away with acknowledging that, as if he pulled one over on us). Somehow, I think karma will soon help us understand. We should all be proud of what we’ve so far accomplished as an upstart, grassroots organization over these years together, and that we’re in lockstep when it comes to our continued fight in the pursuit of truth and justice. No one here is settling, packing it in, or dancing in the end zone. I’m truly inspired by our own collective resolve, and that of our “E-9.” Our alumni-elected trustees were instrumental in forcing the Consent Decree discussion, and while they may have been stonewalled and boycotted over many, many months, in the end, their position was never ignored…not by a long shot. In fact, it was acted upon with the very creation of this backroom deal (hence “Frustrated”). They contributed such thought and strategy that I’m optimistic the dominos will begin to fall. 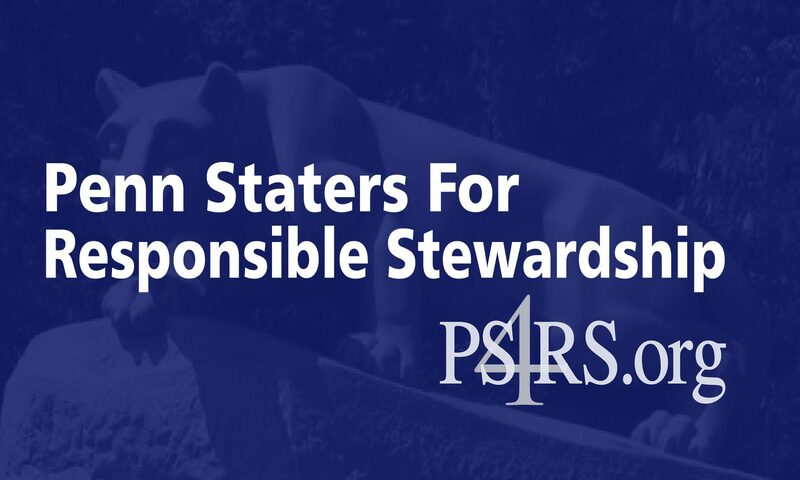 We must continue to do our part: to remain vocal, to expose Penn State’s governance flaws, and to hold those accountable who let us — and the victims — down. There’s a lot more on the table and PSU should go for it. The damage to “Dear Old” by the NCAA and Dr. Emmert can never be undone, but there is a level of justice that should be our goal. Truth first, then justice, of course. I like the term “E9,” which I noted today for the first time. The “E” is particularly meaningful. I don’t get it. If NCAA had no authority to issue a fine, how can they admit this and leave the fine intact? Granted the money might be used in state, but why not just cancel an improper/illegal fine, why put that burden on Pennsylvania residents or the parents of Penn State students.